Slashing R&D in favor of more important things, like wars and profits. Who cares about America’s future? Summary: A follow-up to The face of America’s decline. Another in a series about America’s inability to make the investments in our future necessary to maintain our prosperity. In 2007 we spend $406 billion, 28% of which was by government. Half of the government’s spending is military-related (not including DoE’s spending on nuke weapons, and other hidden items). Some of the private spending was by military contractors. Since WWII R&D spending as a percent of GDP has risen around the world. Federal spending as %/GDP has been falling since the late 1980’s; private r&d/gdp (mostly corporate) has fallen since 2000 (it rose steadily since WWII). For more about this see the BLS data on Research and Development. How do we compare with our competitors? 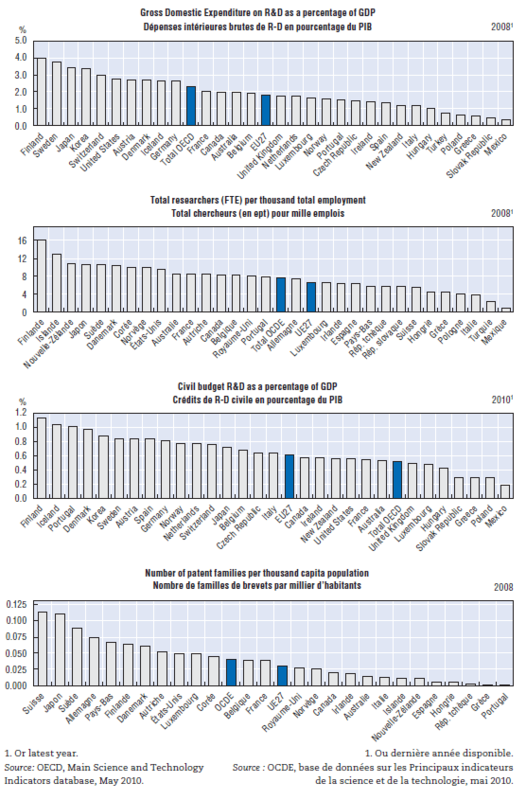 The following graphics come from page 19 the OECD’s 2010 report “Main Science and Technology Indicators“. They include spending on military R&D (otherwise our standing would look even worse). Introduction: How has American invested in its future? Where have we put our money?